As I look around me and observe what is fast becoming accepted and deemed as ‘normal’ in society – things that society has inherently known, without question, to be wrong, deep within the core of its being – I have found myself to be so vexed in my spirit that it has caused me to want to almost become a recluse, hiding away in my house for much of the time. I have tried to reflect upon the feelings that have crept upon me over the last couple of year and couldn’t really find a word to describe the depths of the foreboding that has descended into my soul. All I knew was that I didn’t like this feeling, which made me weep deeply within for the unrelenting decay of every aspect of society, from the highest areas of Politics, the media, entertainment and celebrity culture, right down to the daily lives of the rest of humanity. So I decided that I would remind myself of what it was that Lot actually felt concerning what was going on around him. Below is the passage. It describes exactly the feeling I have, which I could not put into words myself. That feeling is the word ‘torment’. Like Lot, I feel sick of the shameful immorality that has come upon the world like a flood, parading and promoting its ‘new morality’ as a long awaited ‘freedom’, and attempting to ram its ideology down the throats of the rest of society, such as our precious children. This ‘new morality’ is FAR from ‘freedom’. The Biblical equivalent to today’s reality is the account of Sodom and Gomorrah. And what did God do to that place and all who were in it (except the righteous ones that God rescued)? God DESTROYED them. Does that sound like ‘freedom’ to you? Anything that was once unlawful and was inherently known to be wicked and wrong, which humanity is now trying to overturn and make ‘lawful’ for the sake of political correctness and so-called ‘equality’, is a fulfilling of the following scripture. Indeed what sorrow awaits those who have been deceived by the ‘spirit of delusion’ that has persuaded them that any variation of the desires of the flesh should be released and embraced, and accepted as normal and healthy. But just like the account of Sodom and Gomorrah, despite severe warnings, those engaged in these practices do not seem to care less. The more the warnings, the more intent they are on satisfying their desires. God WILL bring His wrath and judgment upon this rapidly lawless earth, against those who refuse to believe in Him. What concerns me the most is the rise of this unrepentant lawlessness WITHIN the Church. Let me make this absolutely clear. WE will be judged by our obedience to/or our rebellion of THE WORD of God. Jesus WILL return for a holy, faithful and obedient Bride. Michele is the author of Come on Church! Wake Up! , The End of The World and The Gospel of Deception – Counterfeit Christianity and the Fate of Its Followers. Available WORLDWIDE as paperback and Kindle, on Amazon, Barnes & Noble, and many other online book stores. After almost a year of intense and exhausting work, I am delighted to announce the release of my third book, The Gospel of Deception – Counterfeit Christianity and the Fate of Its Followers. It is a “Must Read” for all Christians, and even for non-believers, as what it reveals about the state of the Church in our current times may cause you to see the truth and turn you to Christ! 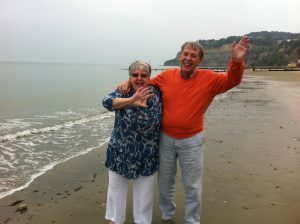 Please visit my website www.michelenealuk.com and check out my previous two books. All three books are like a sequel. Michele is also the author of Come on Church! Wake Up! and The End of The World. Available WORLDWIDE as paperback and Kindle, on Amazon, Barnes & Noble, and many other online book stores. The following is the first chapter of my third book, “The Gospel of Deception – Counterfeit Christianity and the Fate of Its Followers”, which will be released on Amazon shortly, hopefully early September. My apologies for the layout. It is not uploading in the correct style of the actual book, no matter how hard I try to correct it. But I hope you will enjoy reading it, and that this sample will encourage you to buy the book when it is released in a few weeks time. Keep a look out on Amazon! This is a pre-release sample and may contain a few errors, which will be corrected before publication. This chapter is a vital part of the book, as it sets the scene for the whole purpose of writing it. I have chosen not to call it the ‘Introduction’ because I know how tempting it can be to skip reading it! Let’s view this chapter as the ‘Trailer’, giving you the desire to want to read to the very end! But before I start, I would like to tell you a little story, about how this book came to be written. In June 2014, shortly before my second book, The End of The World and What Jesus Has to Say About It, was published, I felt the Lord give me the title for this new book, which you are holding in your hands. I began to write a few scribbled notes, but got sidetracked with the arrival of my parents who were relocating to the area where I live. The manuscript remained untouched for the following six months. Then, as I mentioned previously in the Dedication and Acknowledgements, my dad died unexpectedly in January 2015. The shock has been so deep that I have not been able to focus on writing this manuscript for the past two years. In December 2016, I felt an urgent prompting from the Lord to ‘get on with it’. I knew what the message was to be about, but I only had a quarter of it written down. The rest of it was a jumbled mess in my head that had been rumbling around for two years and just wouldn’t go away. I began to type what I had already handwritten, but when my notes ran out, I still kept typing! I was stunned at the ease with which the words flowed out of my fingers and on to the keyboard! I felt the Holy Spirit was almost dictating the words to me, and that I was simply His secretary! Just one week later, the first draft of the manuscript was completed! A further five months have been spent knocking it into shape, proof reading and correcting, and making it ready for submission to the publisher. All I know is that when God wants something done, He really does make it happen, regardless of our natural inabilities! All the glory belongs to Him! So, let me begin to share with you what is an immense burden in my soul, and which frequently drives me to tears of intercession before the throne of God. During the past twenty years or so, something has been happening in the Church. Whatever it is, it seemed to start out as a trickle, but has now escalated into a tsunami. The Church of Jesus Christ is in deep trouble, but by and large it doesn’t seem to care. The fact that the Church seems to be deeply apathetic and indifferent to its sickly spiritual condition is a very serious state to be in, especially in the times that we are now living in. When I became a born-again, Spirit-filled follower of Christ in 1992, the Church, whatever the denomination, generally seemed to have a reverential fear of God’s Holiness, His Justice, and the authority of His Word as the truth. Most churches seemed to know what was right and wrong, in accordance with Holy Scripture, and as such, believers seemed to generally live by the truth of the Word of God, particularly in previous centuries. So when they went astray, the Holy Spirit living in them would prick their conscience, convicting them of their sin, and enabling them to experience godly sorrow for disobeying God’s Word. This would enable them to confess and repent of their sin and turn back to God for forgiveness and restoration. Even as little as twenty years or so ago, outwardly this generally appeared to be the case within the global multi-denominational Church of Jesus Christ. But something has now changed…and it is not for the good. A demonic spirit has crept in unnoticed. This spirit is sitting in our pews, masquerading as an ‘Angel of Light’, and is slowly and subtly spreading his evil deception throughout the whole Church, even ascending to the lofty heights of the pulpit. What is this demonic spirit? It is the deceiving spirit of ‘counterfeit Christianity’; it is a ‘Christianity’ that practices falsehood, and ‘loves to live a lie’ (see Revelation 22:15-16). What do I mean by the term ‘counterfeit Christianity’? Well, let’s take a valuable painting as an example. A counterfeit painting looks so much like the real painting that even those who are experts in the field of Art can be fooled into believing that the counterfeit painting is the genuine article. So, with counterfeit Christianity, it can appear and sound so much like genuine Christianity, that unless we search the Scriptures to know what is the truth, this counterfeit Christianity will easily deceive us. As with all counterfeits in life, you have to know and study the genuine article in order to detect when a counterfeit is in front of you. The fact that something of this nature has been happening in the Church in the past twenty years is of grave concern. Alarm bells should be ringing, warning believers to Wake Up! Satan has crept into the Church with a blanket of deception. He has thrown this blanket over the followers of Christ and is smothering them with it, causing them to fall into a state of drowsiness. And in this drowsy state, Satan is allowing his demons to invade the Church with counterfeit doctrine, counterfeit teaching, and counterfeit supernatural manifestations. All these counterfeits look and sound like authentic Christianity, but they are not! The purpose of a counterfeit is to deceive. Counterfeit Christianity is designed to deceive followers of Christ, and lead them away from the absolute and infallible truth of God’s Holy Word. This is what Satan wants. He did this in the Garden of Eden. Counterfeit Christianity tries to ‘negotiate’ with God. In many Churches today, leaders are reading God’s Word, then saying “Surely that’s not what God really means?” This sounds just like the serpent in the garden, doesn’t it? (see Genesis Chapter 3). Satan has slithered into our churches and is deceiving the minds of our shepherds – our church leaders, who are meant to protect us and watch over our souls, so that we do not get dragged away by ‘wolves in sheep’s clothing’ (see Matthew 7:15). Sadly, some who were once our uncompromising leaders have now listened to Satan’s lies and have been deceived into believing that they can negotiate with God’s Holy Word. Our once steadfast leaders have become the very ‘wolves in sheep’s clothing’ that they were supposed to protect us from. Instead of this raising alarm bells in our spirits, much of the flock is so drowsy that we are following our deceived leaders like ‘sheep to the slaughter’. This is “the blind leading the blind, and both fall into the pit” (see Luke 6:39). In the spiritual realm this is not a metaphorical ‘pit’; it is the pit of hell, the eternal fire, where Satan and his demons, and all who follow his lies and deceptions will end up for eternity (see Matthew 25:41). As we will see later in Chapter 4, counterfeit Christianity is the Church preaching ‘another gospel’, a watered-down, compromised and altered ‘gospel’ to suit the times and the culture we are living in. Its outward appearance is very appealing to a growing culture of followers of Christ who now seem to want a gospel of ‘anything goes’. In fact, counterfeit Christianity is so appealing to followers of Christ, that Jesus Himself warned us that, in the End Times, these false prophets will be able to deceive even the very elect. “At that time if anyone says to you, ‘Look, here is the Messiah!’ or, ‘There he is!’ do not believe it. to deceive, if possible, even the elect. 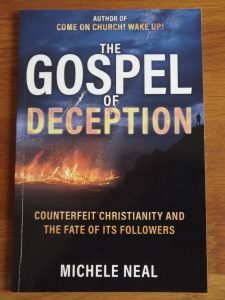 Counterfeit Christianity seeks to persuade the Church of today to ‘evolve’ from what it considers to be ‘dated’ historical beliefs and teachings, and its goal is to create its own faith and its own ‘gospel’, but covering its deception by retaining the title of ‘Christianity’. In its struggle to usurp authentic Christianity, counterfeit Christianity sets up its own versions to run alongside authentic Christianity, as a new expression of it to ‘suit the times’. I wonder what Jesus feels about this? What must He feel when He sees what His shepherds are doing to His Gospel, and the destruction they are causing to His flock? It must be a pungent stench in His nostrils. He has made it very clear that all who practice and peddle the evils of falsehood will not be permitted to enter the Kingdom of Heaven (see Revelation 22:14-15). Yet, tragically, the many forms of counterfeit Christianity that are emerging today believe that their ‘new gospel’ will still save them, and they convince themselves that much of God’s Holy Word is no longer correct or valid! Millions of people are walking, in an almost ‘hypnotized’ state, along the path of counterfeit Christianity, and the ‘Pit of Apostasy’ has opened its mouth wide, and is bubbling like a cauldron, ready to receive all who fall into it. There was a time when Christians were generally respected, and that was not so long ago. They were considered as people with integrity and morality, who were honourable and trustworthy. But over the years, media reports exposing large scale misconduct, abuse and corruption within religious institutions, which has remained hidden for decades, has caused a turnaround in the way the world views Christians and Christianity. Where once there was respect towards followers of Christ, there is now at least indifference, but at worst there is open hatred and persecution. They see and hear things about people who profess to be followers of Christ (who are meant to represent Christ upon the earth) committing gross sins and covering them up, hoping that their ‘deeds of darkness’ will never be found out. But God never allows un-confessed sin to remain hidden. When followers of Christ fail to confess their habitual sins, and also remain unrepentant, in time God always exposes it. When God exposes the sins within His Church, the world must surely see us as a bunch of filthy, disgusting and despicable hypocrites, and that is probably putting it mildly. They see us dishonouring the name of Jesus Christ, and trampling His name in the filth of our unrepentant sins. Is it any wonder that the world has decided that Christians and Christianity are no longer worthy of respect? Sadly, in the Church’s desire to ‘resurrect’ its previous position of respect in the community and the eyes of the world, it has resorted to compromise. Where once it was respected for its steadfast adherence to the Holy Word of God, the Church is now tearing God’s Word to shreds by forsaking His ways and adopting alternative, worldly, man-made views, opinions and practises and labelling them as the new ‘Emerging Christianity’. This may cause the world to offer a token of ‘respect’ towards the Church again, but at what cost to the Church’s eternal destiny, when the world’s respect for the Church has been gained through its compromise of God’s Word? This is what the Church of today is doing! By following after and implementing counterfeit teaching, we are saying to God that we no longer want to obey His Holy Word, and so we are effectively ripping it to shreds and burning it in the fire! The horrendous fate of this king, his descendents, and also his attendants, for refusing to listen to God’s warnings, is recorded in Scripture, in Jeremiah 36:27-31. I urge you to read it, as it stands as a dire warning to those who are responsible for God’s people. As followers of Christ, our desire should be to obey God’s Word and please Him. Our motives should not be to please man, when those things are contrary to God’s Word (see Galatians 1:10). Our mission should be to preach to the world the Gospel message of salvation through faith in Jesus Christ, of God’s forgiveness of our sins, and about living our lives in obedience to His Word, which will ultimately result in our souls being saved from eternity in hell so that we can enter the Kingdom of Heaven. Yes, God does love them as human beings because He created them and does not want anyone to perish, but His desire is that all would come to repentance (see 2 Peter 3:9). But it comes down to this: God hates sin so much that He sent His son, Jesus Christ, to die on the cross and shed His blood, to take upon Himself the full punishment of all our sins. He did this to make it possible for the whole human race to receive God’s forgiveness of our sins, and salvation from eternity in hell… But we have got to accept this truth and believe in, follow and obey Jesus. If we claim we are a follower of Christ, obedience to the Word of God is not an optional extra! With this knowledge, why on earth would the Church think it is okay for followers of Christ to carry on living lives of sin? But more importantly, why would the Church think that God is okay with us continuing to sin, and remaining unrepentant about it? The Church today has been, and is being seriously deceived by the ‘god of this world’ (see 2 Corinthians 4:4). In the following passage taken from his classic devotional, My Utmost for His Highest, Oswald Chambers gives us a serious message about the subject of sin in the lives of followers of Christ. Co- Crucifixion. Have you made the following decision about sin – that it must be completely killed in you? It takes a long time to come to this complete and effective decision about sin. It is, however, the greatest moment in your life once you decide that sin must die in you – not simply be restrained, suppressed or counteracted, but crucified – just as Christ died for the sin of the world. No one can bring anyone to this decision. We may be mentally and spiritually convinced, but what we need to do is actually make the decision that Paul urged us to do in this passage. Pull yourself up, take some time alone with God, and make this important decision, saying, “Lord, identify me with your death until I know that sin has died in me.” Make the moral decision that sin in you must be put to death. This was not some divine future experience on the part of Paul, but was a very radical and definite experience in his life. Are you prepared to let the Spirit of God search you until you know what the level and nature of sin is in your life – to see the very things that struggle against God’s Spirit in you? If so, will you then agree with God’s verdict on the nature of sin – that it should be identified with the death of Jesus? You cannot “reckon yourselves to be dead indeed to sin” (6:11) unless you have radically dealt with the issue of your will before God. This is a very clear message to the Church, but sadly, it is even clearer that the Church is paying absolutely no attention! The further that professing Christians are led away from obeying God’s Word, and the more they are permitted to remain in their sinful lifestyles, the easier it becomes for Satan to cause them to believe his counterfeit doctrines and counterfeit teachings. He doesn’t do this in big and obvious ways because followers of Christ would spot his deceptive activity a mile off, and they would immediately reject it! Satan is not stupid! He knows how to deceive those who say they are followers of Christ. All Satan has to do is subtly twist God’s Word here and there, and repackage it to make this ‘twisted word’ sound like God’s truth. Satan is targeting his deception at the shepherds; the leaders of the Church, who are falling for his counterfeits like ninepins in a bowling alley. The leaders believe these ‘lovely-sounding’ lies, and then feed these counterfeits to the sheep, who gobble up these ‘poisons’ and swallow them whole. Come on Church! Wake Up! … What are we doing? God’s Word is clear on what is right and what is wrong. His Word is holy, righteous and just, and He has given us clear warnings of the consequences we will face now and in eternity, when we disobey and rebel against His Holy Word. The Church is on the brink of disaster. It is wobbling precariously on a knife-edge, teetering on the edge of the abyss. If it does not wake up urgently, Jesus will snuff it out (see Revelation 2:5). The Church is in perilous times. Jesus warned of a deception that would invade the Church during the End Times, leading believers to fall away from the truth, which we will see later in Chapters 2 and 4. Read this severe warning, which God gave to His Prophet Malachi, to deliver to God’s Spiritual leaders at that time. It stands out as a beacon of warning to the whole of the global Church today. “Listen, you priests — this command is for you! of Heaven’s Armies, “or I will bring a terrible curse against you. I will curse even the blessings you receive. Indeed, I have already cursed them, because you have not taken my warning to heart. I will punish your descendants and splatter your faces with the manure from your festival sacrifices, and I will throw you on the manure pile. Then at last you will know it was I who sent you this warning so that my covenant with the Levites can continue,” says the Lord of Heaven’s Armies. “The purpose of my covenant with the Levites was to bring life and peace, and that is what I gave them. This required reverence from them, and they greatly revered me and stood in awe of my name. They passed on to the people the truth of the instructions they received from me. They did not lie or cheat; they walked with me, living good and righteous lives, and they turned many from lives of sin. Counterfeit Christianity is now running rampant throughout the Church, and the sheep are falling away from the truth in astronomical numbers. We want a cosy kind of ‘Christianity’ that comforts us but does not convict us; soothes us but does not shake us. 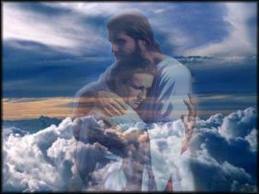 We want to be saved but still sin; cry but not confess; rejoice but not repent. This kind of Christianity is counterfeit Christianity. Measure it with the truth of God’s Word and you will see how utterly deceptive and devoid of God’s authority our modern-day ‘Christianity’ really is. We are living in a time where many of our churches are being lead by pastors, ministers, vicars and priests who refuse to submit to the authority of God’s Word, and we are listening to and believing the deceptions that they preach. Surely we must be able to see that what is happening in the Church indicates that we are in the times of the ‘End Times’ Apostasy …the great ‘falling away’. Apostasy does not just mean falling away from the faith and becoming an atheist. Apostasy also mean a falling away from believing and obeying the truth of God’s Word, and instead, believing and following a counterfeit Christianity, yet still claiming and professing that we are a follower of Christ. The reason for this book is to expose counterfeit Christianity. In the following chapters, we will look at what Jesus said about it in the Gospels, and what the apostles said. We will also highlight what some of the varying forms of counterfeit Christianity look like in the Church today. We will look at what God’s Word says will be that fate of all who believe and follow false doctrine and false teachings. Then we will end this book with an offer of hope to all who want to be free from counterfeit Christianity. Jesus is coming back for a Church that is faithfully following and obeying the truth of God’s Word. He will not receive a Bride who has rejected His Word and is following a counterfeit. “Write This in the Book!” Recently, whilst in the process of writing this manuscript, I struggled to fall asleep one night. I was very restless, and I tossed and turned for ages. My mind just would not settle, but I didn’t know what the problem was. So I prayed and asked the Lord if there was anything He wanted to say to me. Instantly I felt the Lord say, “Write this in the book.” I switched my bedside light on and fumbled about for my note pad and pen, and then began to write. What I wrote was in the prophetic style of the Lord speaking to followers of Christ who are sinning, and are unrepentant. Below is the message, which flowed out of my pen and onto the paper in the early hours of the morning. A Message from the Bridegroom “On the day you gave your life to Me, I forgave you of the sins of your past and washed you clean, so that you could start living your new life in Me, without spot or blemish. I clothed you in a clean, pure white wedding garment, as one who is betrothed to Me. But you must keep your garment clean and pure through confession and repentance of your daily sins. “Does My Word not tell you in 1 John 1:8 that if you say you have no sin, then you are deceiving yourself? Does My Word not also say in 1 John 1:9 that if you confess your sins, I am faithful and just to forgive you of your sins and cleanse you from your unrighteousness? I will do this for if you confess and repent. “But if you deliberately keep on sinning and disobeying My Word, whilst still saying you are My follower, this Word that you refuse to obey also tells you in Hebrews 10:26-27 that there is no longer any sacrifice that will cover your unrepentant sins. There is only the terrible expectation of God’s judgment and the raging fire that will consume his enemies. “If you fail to keep your wedding garment clean through daily confession and repentance, on the Day of Judgment I will see your filthy wedding garment, and I will remove it from you as one who is not worthy to wear it or to be joined with Me as My Bride. “My Word says in Revelation 22:15 that you will be left outside the Kingdom of Heaven, walking around naked and ashamed. This is because I will have removed the wedding garment, which I gave to you when you first believed in Me; when your love for Me was so great that obedience to My Word was your delight. Indeed, the time appears to be very short. Come on Church, Wake up! It has been a while since I last posted a blog. On 20th June (2017), our lives were catapulted into a non-stop vigil at the bedside of my 90 year old father-in-law, who was rushed to hospital. After a few days, he seemed to recover and they were looking at sending him back home at the end of that week once they had arranged extra care in place for him at home. Then he suddenly took a turn for the worse, being unable to make any kind of coherent conversation, except for miraculously saying the Lord’s Prayer perfectly when the hospital chaplain came in to minister to him! After that, he returned to mumbling all sorts of things that none of us could understand. He also began to refuse all food and drink. After a few days of no intake, and with no prognosis of recovering from what was causing this, as a family we had to make the agonising decision of accepting that he should be placed onto ‘end of life’care. From that moment on, his appointment with death was approaching, and so we took it in turns to stay by his side as much as we possibly could, apart from needing to go home to sleep. We told him how much we all loved him, and thanked him for his love for us all. We prayed over him daily, anointed him with oil, and sang hymns and worship songs to him at every opportunity. The nursing staff and some of the patients in the ward were moved to tears, hearing what they described as a ‘choir of angels’ singing around his bed. Our ‘end of life’ vigil lasted for 8 days. During that period, our daily life came to a complete standstill. Nothing else mattered to us except being with him to minister to him as he approached death. We watched him as he fought daily to cling on to life, whilst we gentle whispered in his ears words of peace and assurance, encouraging him to not be afraid to let go of his earthly life and be with the Lord. Each night that we went home to get some sleep, we thought that the phone would ring in the middle of the night with the news that he had passed away. But each morning when we rang the hospital, he was still hanging on to life. On 8th July we were due to attend the wedding of my cousin’s daughter. My father-in-law knew that this wedding was coming up. On the evening of 7th July, my own daughter and I stayed by his bedside, telling him that we were all looking forward to the wedding (but not really knowing if we would actually be going, or whether we would be at his bedside again). When we left him the night before the wedding, we once again sung some powerful hymns to him and spoke words of love and blessing into his soul, reassuring him not to be afraid of passing from his earthly life and into the next life. Over the course of the 8 days, I had told him endlessly that when his time of departure was near, Jesus would come for him, and that when he saw Jesus, he must take hold of His hand and go with Him. We left his bedside about 9.30pm. When we got home, I got my outfit ready for the wedding the next day. I felt peaceful about it, with some sort of supernatural peace that we would be going to this wedding, even though in the natural it seemed that this would not be the case. The next morning, my husband woke me up at 7am and said, “Dad passed away about 6am.” We both had a cry, but felt so much peace that it was as if his dad was blessing us to enable us to go to the wedding. It is really difficult to try to put into words the impact of the feelings of grief, peace and joy the came upon us all in one go. It seems incomprehensible to us now, that we somehow managed to get up and put on all our finery and attend the joyous occasion of a wedding only 7 hours after he passed away. During the whole of the wedding, we felt an immense peace and love surrounding us and strengthening us, enabling us to join in the celebrations, despite our loss that very morning. All we know is that the Lord came to take his soul to be with Him at the appointed time… a day of grief and joy all in one go. Rest in peace, beloved Cyril. Michele is the author of Come on Church! Wake Up! 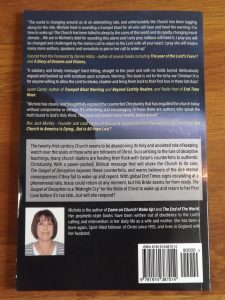 and The End of The World and The Gospel of Deception – Counterfeit Christianity and the Fate of Its Followers Available WORLDWIDE as paperback and Kindle, on Amazon, Barnes & Noble, and many other online book stores. My Dad died very suddenly, and without warning on 17th January 2015. I did not make it to his hospital bedside in time. I missed his last breath by a few minutes…The painful memory of it still lingers in my mind. I wrote this poem in memory of him, and read it out at his funeral. we shared so long ago. What joys these brought to me! that lit your ever-smiling face. There’s a strange sad silence here. My eyes keep shedding tears.